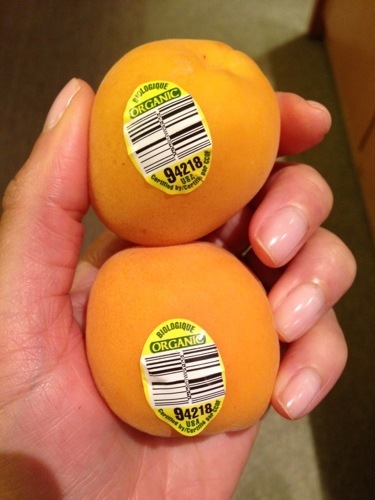 Apricots are high in vitamin A, which promotes good vision. According to whfoods.com vitamin A is a powerful antioxidant, quenches free radical damage to cells and tissues. Apricots are also a good source of fiber, vitamin C, potassium and tryptophan. Researchers who studied over 50,000 registered nurses found women who had the highest vitamin A intake reduced their risk of developing cataracts nearly 40%. Free radicals are environmental pollutants that our bodies consume daily i.e., processed foods, UV rays, and smoke, carbon monoxide, pollution, additives from foods…, etc. These and so many more factors causes cancers, aging (wrinkles), and cell damages. The best way to combat free radicals is to eat a healthy diet that consists of mainly RAW foods and minimally cooked veggies that has fiber, antioxidants (prevent and repair cells damages), phytonutrients (anti-inflammatory), vitamin K, C, A, and B’s, as well as minerals and protein. Also, wearing excellent quality sunblock to protect your skin from free radicals from the sun (UV rays). Everyone from the lightest to the darkest of skin should wear it. The number one anti-wrinkle remedy is sunblock. Eat, juice, and blend your RAW greens! Wow, wow, and WOW! Thanks for the explanation. Well, currently, I am doing half of the things you listed, so I am on my way to a healthier lifestyle. I need to up my intake of greens. There are only a few veggies that I really like, so I am limited in what I consume. Thanks for educating me. Be blessed.